Today’s automotive industry is evolving at supersonic speeds. In fact, it’s moving so fast that it’s now hard for carmakers to remain fresh. Models typically stay around 4 to 5 years and are usually treated with a facelift halfway through their lifecycle to remain competitive. Things are even more aggressive in the compact SUV market; a segment which has exploded for every carmaker lately in an attempt to grasp a piece of that ever so lucrative “cute-ute” pie. This is where the Volkswagen Tiguan comes into the picture. It’s hard to believe, but this little Golf-based SUV has been with us since 2009 with only a minor facelift. There’s a good reason for this: the Tiguan has been a sales success here in Canada. That being said, a new generation Tiguan will hit our roads in early 2017, but until then, is the 2016 Volkswagen Tiguan 4Motion still fresh enough to hold its ground against its newfound competition? When the Volkswagen Tiguan was released 7 years ago, it featured some of the traits found in high-end SUVs with a more affordable price tag. Yes, the Tiguan was more expensive than its Japanese or American rivals, but it was miles ahead in terms of road manners, build quality, and general refinement. Today, mainstream carmakers have caught up to the Tiguan’s refinement but still sell them at more attainable price ranges. To face this, Volkswagen has significantly dropped the price tag of their little trucklet, with an entry level 4Motion Special Edition model such as my tester starting at just under $30 000, and topping out at $36 998 (before options) for a top of the line Highline model equipped with leather seats and other Audi-like creature comforts. This comfortably puts the Tiguan in the same price range as the Honda CR-V and Toyota RAV4, two of the Tiguan’s most aggressive competitors. Thankfully, what was superior to the competition 7 years ago remains competitive today. The Volkswagen Tiguan’s fit and finish and high-quality materials still allow it to stand out from the crowd. This is, of course, expected from a German automaker. There is, however, an area where the Tiguan is starting to show its age, and that’s in the overall design and ergonomics of its cabin. I’m being picky here, but the Tiguan lacks that extra edge in the way its interior is presented. There’s not enough chrome, not enough piano black plastics or attractive LCD screens like you get in modern offerings. Actually, even current Volkswagen interiors look much more attractive than the Tiguan’s. I’m also not a fan of the way you sit in the Tiguan. There’s something about the way the dashboard is slanted or how the seating position is set up that makes everything feel awkward when you sit behind the wheel. Simply put, the Volkswagen Tiguan’s interior is proof that a lot has changed in the automotive world in the span of only 7 years. The most impressive feature of the Tiguan is the way it drives. 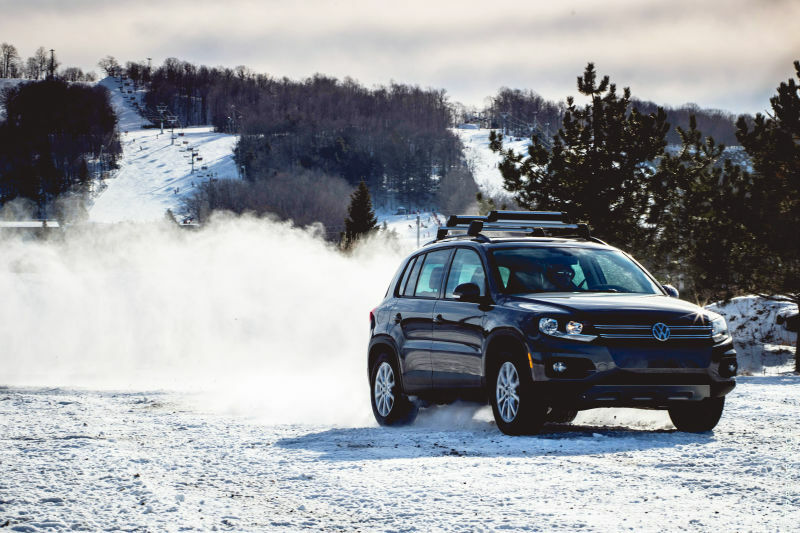 Since it’s based on an older Golf chassis, powered by the same 2.0-liter, turbocharged engine as the current GTI, and fitted with the same 4Motion all-wheel-drive system as the Golf R, the Tiguan’s ace up its sleeve is its ability to put a smile on your face in all possible weather conditions. This thing is a blast to drive. The only gripe I have with the Tiguan 4Motion’s drivetrain is in its 6-speed automatic transmission. Don’t get me wrong, it operates smoothly and gets the job done fantastically well, but I do wish Volkswagen had fitted the Tiguan with the group’s excellent 6-speed dual-clutch DSG system. Road feel is typical of Volkswagen vehicles: solid, well planted, tight and nimble. Punch the accelerator and you instantly feel the low-end torque of the turbocharger as the Tiguan launches off the line with much anticipation. In the bends, the higher ride height leads to much-expected body roll, but it never loses its line. Actually, the more you push it, the more it wants to grip. There’s enough depth in this chassis to explore its limits, something traditionally not found in mainstream SUVs. Bring it in the snow and you’ll be even more impressed by the way it behaves. Using a Haldex coupling system to transfer the power from front to rear, Volkswagen’s 4Motion system in this application can transfer up to 100% of the available power to the rear wheels upon demand. This translates to tail-happy power slides and an ability to minimize understeer; something rather impressive for a front-wheel-drive bias system. It also finds instant grip all the time. I certainly didn’t expect to have this much fun in the snow with an SUV. All of this Haldex differential talk may be fun and dandy, but what buyers are looking for above all in a compact SUV is cargo space, comfort, and value, areas in which the Volkswagen Tiguan unfortunately falls behind. Although the cargo area has been conveniently packaged to maximize room in a vertical fashion, the Tiguan still has the smallest cargo space in its class. Rear leg room is also somewhat cramped, even with the convenient rear bench that can be pulled back and forth. All in all, the Tiguan works for active young couples, but is less suited for the young family of four. Thankfully, there is a large market for this kind of demographic. If you’re willing to trade off cargo space, rear seat leg room, and shiny interiors in favour of a solid German construction and all-weather sports-car-like characteristics; something usually non-existent in modern SUVs, then the 2016 Volkswagen Tiguan 4Motion will definitely have you served.